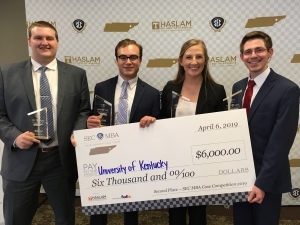 MBA students at the University of Kentucky will have the opportunity to participate in various competitions such as business plan and business concept competitions as well as case competitions. This is a premier extracurricular opportunity to compete among the best MBA students from across the region at top-level competitions, including the Alltech Innovation Competition, the Southeastern Conference Case Competition and Idea State U Competition, among others. 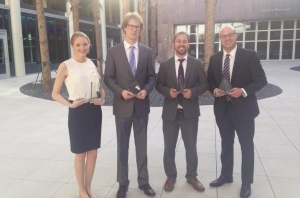 The UK MBA case competition team Alexander Wilken, Jason Scarpa, Erika Penrose and Williams Sanders IV placed 2nd at the 7th Annual SECU MBA Case Competition 2019. This competition, held at the University of Tennessee's Haslam College of Business, provided an opportunity for SEC business schools to showcase their students’ skills at solving simulated or real-world problems. The competition's sponsor and business case was presented by FedEx. 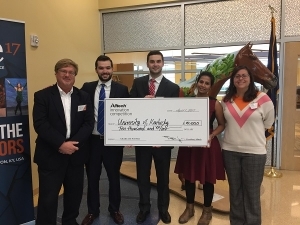 The University of Kentucky MBA shared top prize in the Alltech Innovation Competition 2017, winning $10,000. The UK graduate team included Fletcher Young and Zach Yonts with their venture Stillage Solutions. By using leftover stillage from the brewing and distilling process to produce activated carbon, the team hopes to develop a low-cost, high-quality and more environmentally friendly activated carbon product than what is currently developed using coal, coconut shells and wood. The Gatton MBA team of James Davey, Jordan McMurtrey, Lauren Scanlon, and Luke Williams placed second at the 2015 Southeastern Conference (SEC) MBA Case Competition where 14 SEC Universities competed. Teams were presented a business case centered on sustainability issues relating to a global mining company. 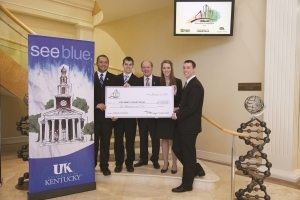 Students from the University of Kentucky’s MBA program placed third in the business plan competition at Idea State U. 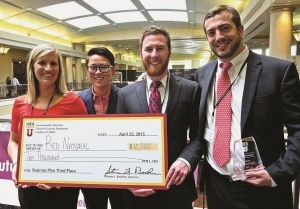 The “Red Natural” team of Joanna Foresman, Andrew Wachs, Jeremy Madigan and Wen Zhao won $10,000 at the annual contest matching teams of young entrepreneurs from universities across the state. The UK foursome developed a business plan for a natural source of red food dye based on research by Seth DeBolt in UK’s College of Agriculture, Food and Environment. 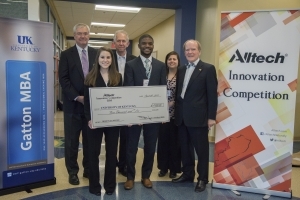 The University of Kentucky MBA team, Erica Clark and Miguel Doughlin, received $4,000 for winning the Alltech Choice Award at the Alltech Innovation Competition in April of 2014. The team's venture, Aryzma Technologies, produces enzymes that assist in the processing of starch, reducing energy costs and making the process more environmentally-friendly. The University of Kentucky MBA team of Lee Gage Goatley, Jarrod Willis, Jordan Denny and Jordan Laycock took 1st place at the Alltech Innovation Competition winning $10,000, selected by a panel of independent entrepreneurs and private investors. The competition was centered on creating jobs in the Commonwealth among the highest unemployment counties. The UK MBA team proposed a plan for reclaiming mountaintop sites by growing switchgrass for fuel production resulting in additional income for Eastern Kentucky farmers.